Even as a high school athlete on both the swimming and softball teams, Cindy Tarantino hated the scale. By 17, at 160 pounds, “I knew I wasn’t healthy,” she says. By age 20, she’d hit 200. “I was devastated that I had become so heavy, but I still wasn’t motivated enough to do something about it,” she says. How hopping on a bike seat at the gym helped Cindy Tarantino get her best body ever. When she quit smoking in 1999, she substituted food for cigarettes and gained 30 pounds in 6 months. She bounced on and off different diets for women, but nothing helped. “I was looking for a quick fix that didn’t exist,” she says. The Breaking Point: In 2001 some coworkers invited Tarantino to a spinning class after work. “They were raving about how great it was, and I wanted to see what all the fuss was about,” she says. Her first class was tough, but she was hooked: “I couldn’t wait for the next session,” she says. Around April 2002, Tarantino won a 6-month YMCA membership in a raffle. She began a muscle-conditioning class twice a week on top of spinning: “I started seeing muscle tone in my arms, legs, and even my abs,” she says. When her free membership was almost up, she landed a job at the Y so she could continue to work out for free. 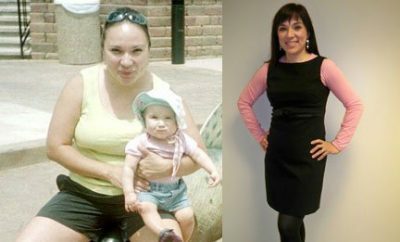 She ditched 50 more pounds over the next 2 years. Awesome motivation!! Thanks for sharing!! You look amazing! I hope to be there someday. Same question, did your skin tone up or were there issues with sagging? Did you have any issues with sagging skin? That is my fear!